This novel threads the large-scale effects of war into everyday occurrences. 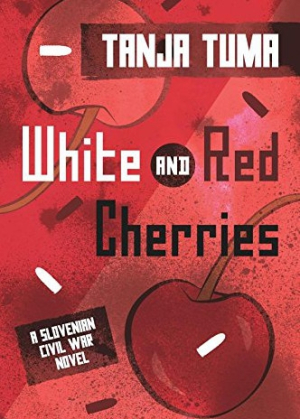 White and Red Cherries examines a period of fascist rule in Slovenia, and the communist years that followed. Through the story of a band of friends whose lives change when they join opposing sides, Tanja Tuma’s historical novel captures the divisive nature of war, centering on a dramatic sacrifice and its lifelong repercussions. The story begins in 1943 and is shared through the perspectives of multiple, diverse characters. These include Valeria, who is forced to leave her village in the Brkini Hills and fight alongside the partisans; Sanja, a pianist, whose experience in Stalinist Russia comprises one of the book’s heartbreaking betrayals; Marjana, a nurse devastated by witnessing death in a concentration camp; Ada, Marjana’s sister; and Ada’s husband, Andrej, a psychiatrist involved in the anti-communist Home Guard. The emotional toll of war reveals itself in the way that the men of the book become conflicted people whose anger blinds them. The women, with few exceptions, become resilient forces who set aside ideals in favor of pragmatism. Despite their differing politics, the group remains bound by love, until Ada makes the critical decision to save her family at the cost of simultaneously destroying it. At times descriptive rather than active, with occasional grammatical errors, the writing sharpens in scenes that feature Valeria. A resourceful young woman who transforms herself from an expert shooter and undercover operative to a respected figure after the war, she is the most vividly drawn of the friends, displaying consistent, strong convictions. Her encounters reveal courage born of the will to survive. Later chapters are narrated by Valeria’s daughter, Anna, and Ada’s son, Martin, when both are older and reflecting on their pasts. These sections feature less meticulous prose; they summarize events, explain what became of certain loved ones, and shift the focus toward Anna and Martin’s personal conflicts. Anna and Martin’s late arrival in the novel, especially after their parents’ dynamic stories, make them paler shadows within the cast of characters. Still, their story builds on valuable themes of psychological damage and forgiveness. Tuma succeeds in threading the large-scale effects of war with everyday human problems. From secrecy and exile to shifting identities and border crossing, from marital distress to stolen joys, from loss to reconciliation, the narrative weaves a fascinating account of a central European country at a lesser-known juncture in its history. With its well-considered cast, White and Red Cherries offers perspective on the many ways sudden decisions can shape the future, and how the line between right and wrong is not always simple to define.